It is always so difficult to say goodbye to our outgoing design team members. 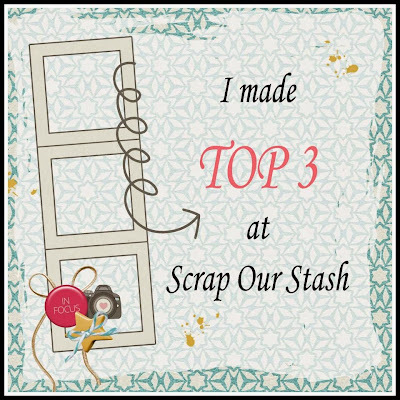 Each one has contributed to and supported Scrap Our Stash in our success as a challenge blog. We appreciate all of the beautiful creative inspiration you’ve shared with our followers inspired by our bi-monthly challenges. 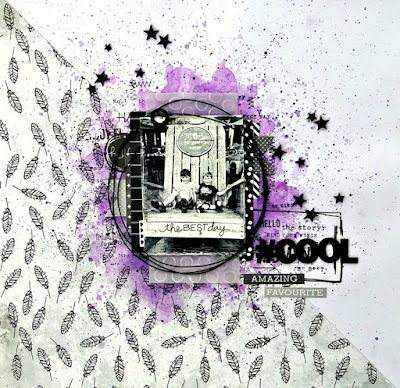 "Hi there, Zsoka here with you today with a new layout for the sketch and stash challenge! I've followed the sketch closely because I liked it as it was plus it's not a layout I would normally do! I like doing different styles once in a while! 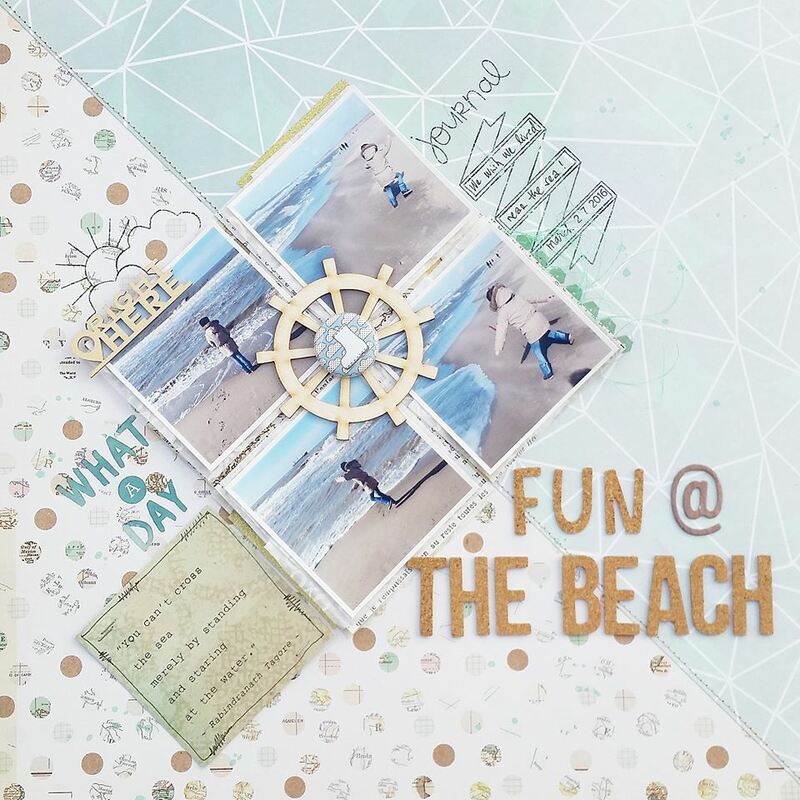 From my stash I pulled out some old polka dot paper, searched for a quote that's related to the sea and I used quite a few rub-ons (sun and clouds, What a day, Journal piece, even the mint sequins!). I hope you'll play along with us, there's still a couple of days to do so! 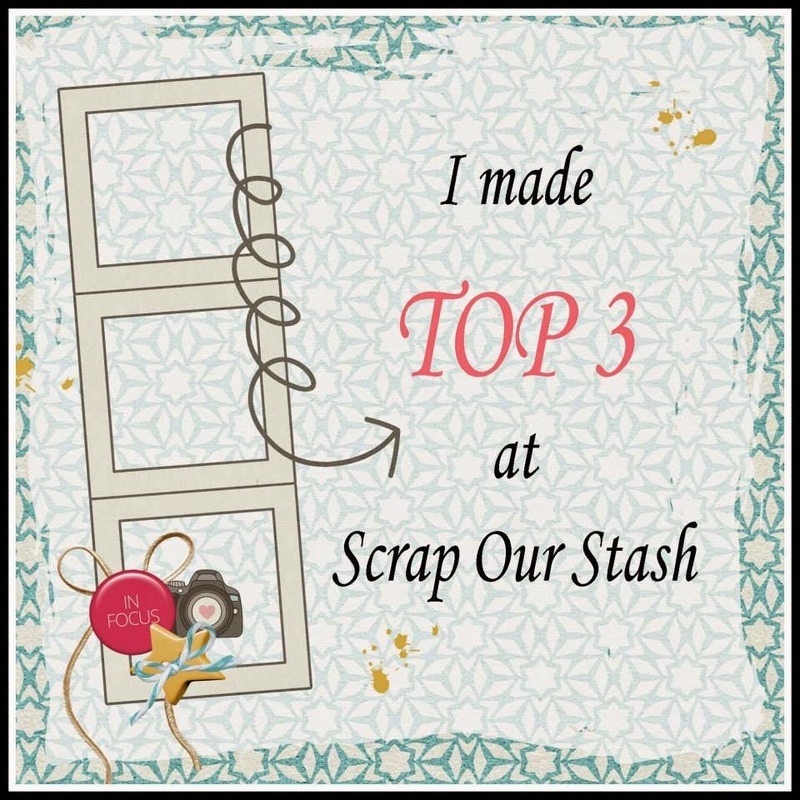 the June Stash Challenge, please click HERE. Just a couple of days left to get your layout uploaded! "At first, I had a hard time figuring how I would interpret this sketch. After putting it aside, I've decided to use the diagonal background and only one picture as a focal point. I then picked several elements from the lists... polka dots, plum and quartz colors, a quote and rub-ons... a lot of them! I used them to compose my background exactly the same I usually to with stamps." 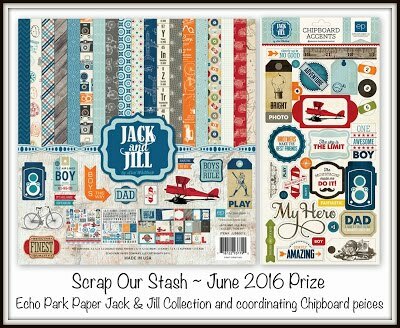 Who's getting their scrap on this weekend? 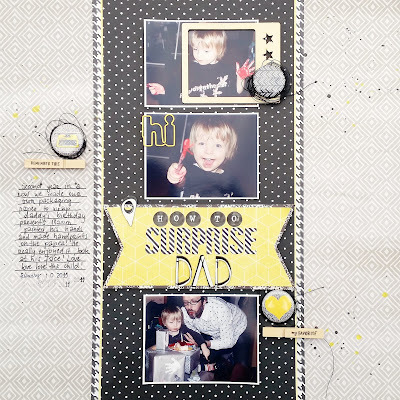 Here is a beautiful layout by Designer Renee to kick off your scrappy weekend! "I loved this sketch so much! 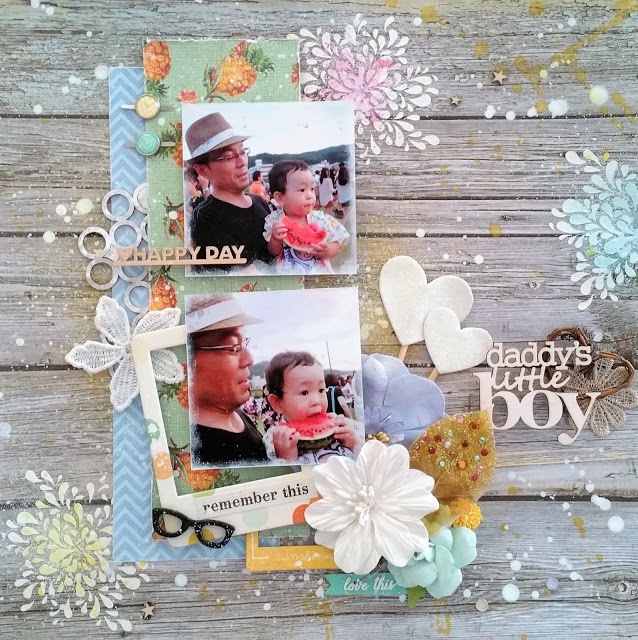 It was perfect for the collection of photos I had from a day outside with my family. From the lists I picked polka dots, Quartz, and Rub ons. 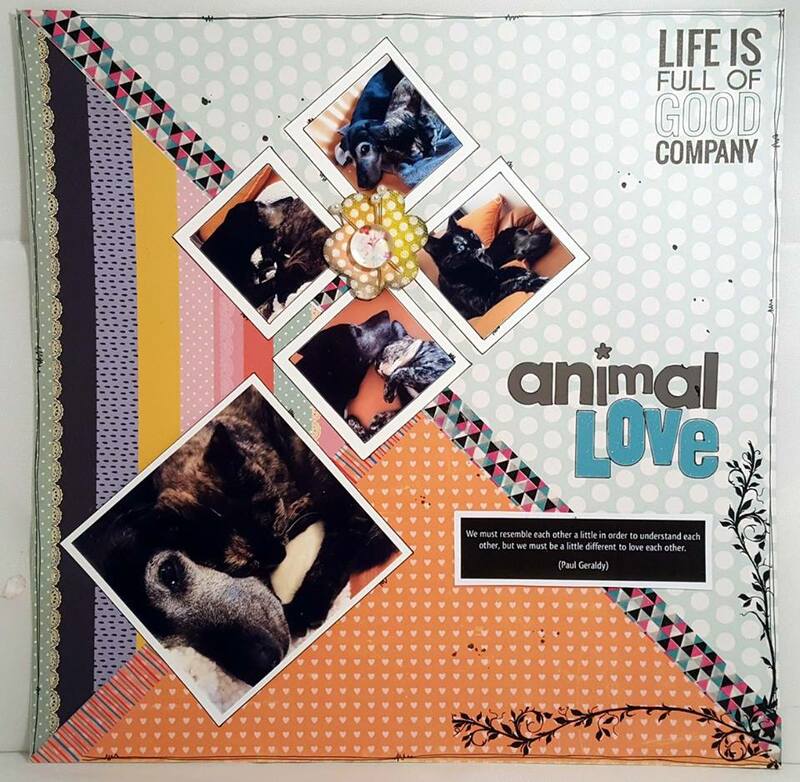 I used some more of the Fancy Free collection with this page- I loved I could incorporate multiple papers. Such a great way to use up scraps :) I hope to have inspired you to give it a go and enter this challenge!!" 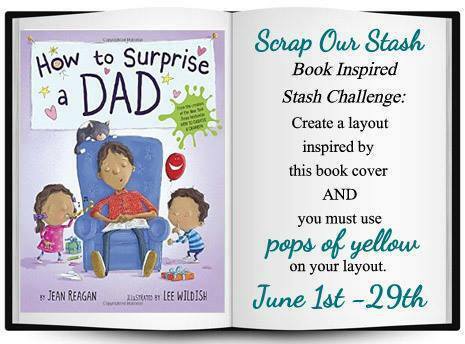 For more information about this challenge or the June Stash Challenge, please click HERE. "I loved to work with this sketch +3 challenge!!! Hope you´ll join us for this challenge!" 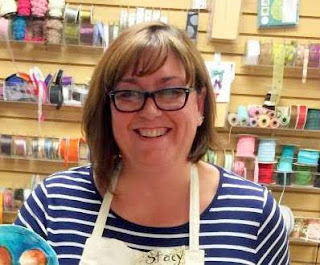 "When I first saw this sketch (+) challenge, I was a little stumped on what I wanted to create. I loved the squares on top of the triangle papers, so I just ran with it. I cut two pieces of patterned paper to create my background and then layered my photos and these cute little cut apart squares and rectangles to create the same feel as the sketch. For the list part of the challenge I used Pebbles and Polka Dots from the first list, Queen & Company and Quartz from the second list and Red from the third list. I can't wait to see your take on this sketch (+) challenge!" Click HERE for more information on the challenge. Have you created a layout for this challenge yet? We are continuing this week with more fabulous inspiration! "It's me again with my interpretation of this month's sketch Challenge! This one took me a minute as I rarely do sideways photos. 2. Quote (which reads, "The smile on my daughters face, let's me know I'm somebody's hero!" I was happy with the end result! Now it's time to see what you do with it!" Don't forget you can click HERE for more information on this challenge! For the second part of the challenge, I used: List 1 - Polka Dots, List 2 - Queen & Co. Bling & Quartz (flowers) and List 3 - Rub Ons. " You can find more information on this challenge HERE. Come on, give it a try!! 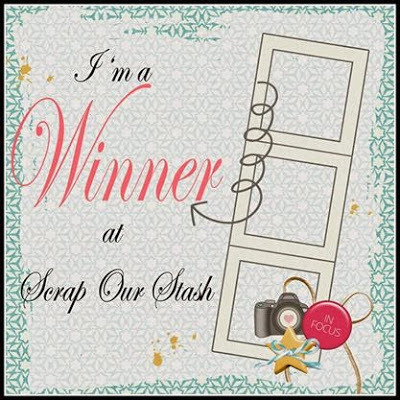 or the June Stash Challenge please click HERE. How about some fabulous inspiration to start off your day! 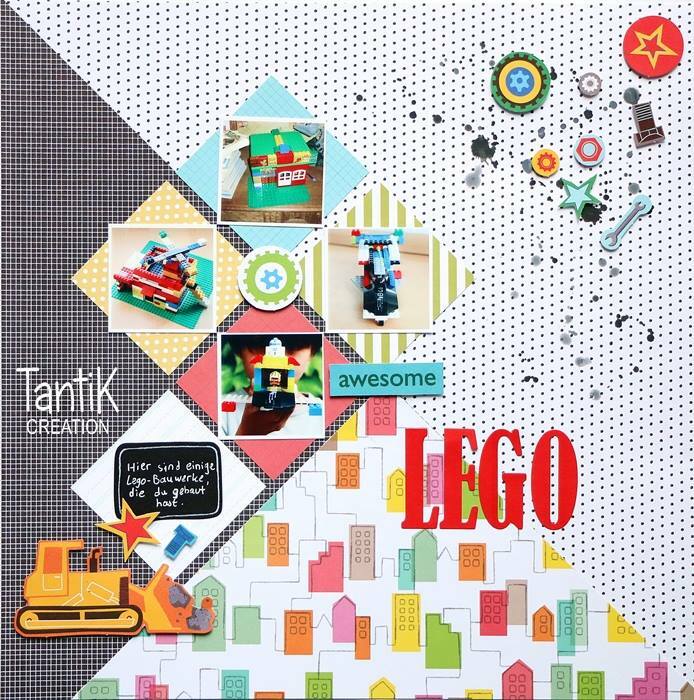 "I always wanted to scrap the photos of my son's Lego creations but I had no idea how. This sketch was the perfect solution of my problem. I must say that I struggled a little bit with the four squares on the sketch. I wanted that my photos stay straight on my layout. So, I just used the squares as my photo mat and I was very happy with the result. 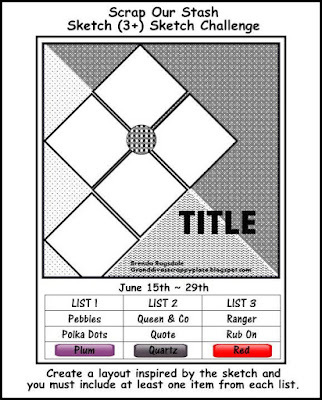 Don't forget to upload your layout to the sidebar by June 29th! 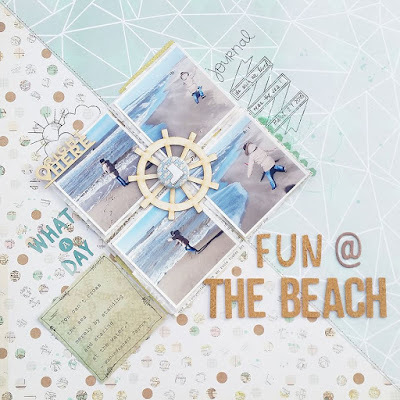 Anyone have scrapbooking plans this weekend? 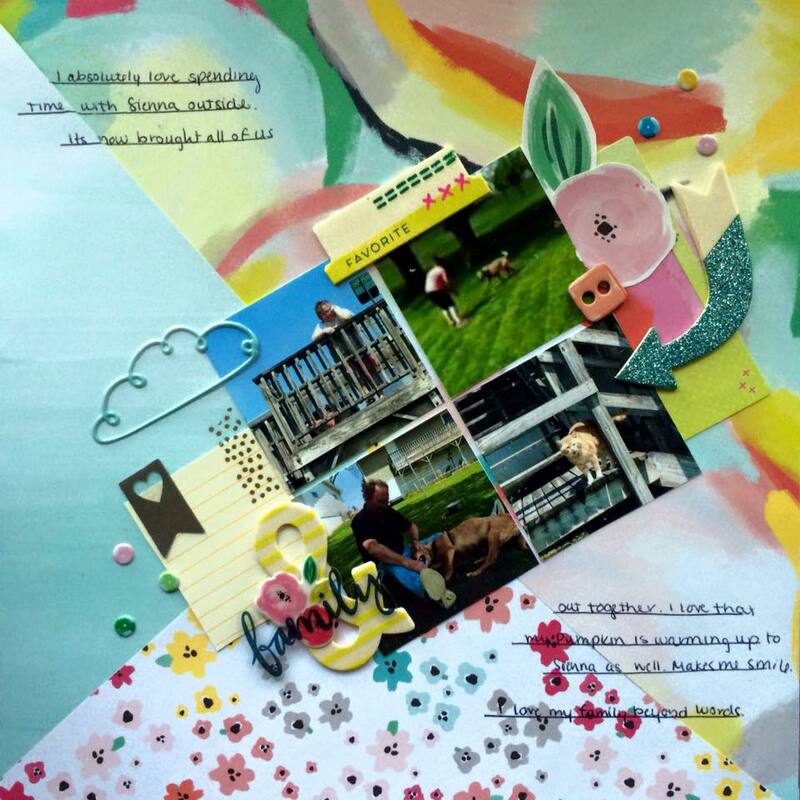 Here's some inspiration from Designer Elena to get your Mojo going! I used polka dot (paper) from list 1, quote from list 2 and rub on from list 3." 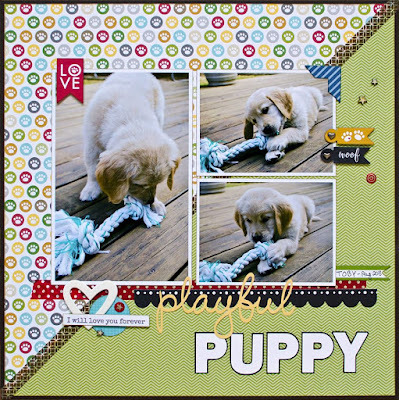 "Time for a cute puppy layout for the latest sketch+stash challenge! The diagonal cut in my layout is going the opposite direction from the sketch. This is more a matter of scrapbooker error than intentional design. I seem to have trouble with diagonal cuts which is probably why I shy away from doing them outside of challenges. LOL! Luckily it still worked out! I straightened out the photo block. I don't know...just too many angles for me and I liked the look better this way. The title stayed in the same location though and then I just played around with some embellishments until I was satisfied." 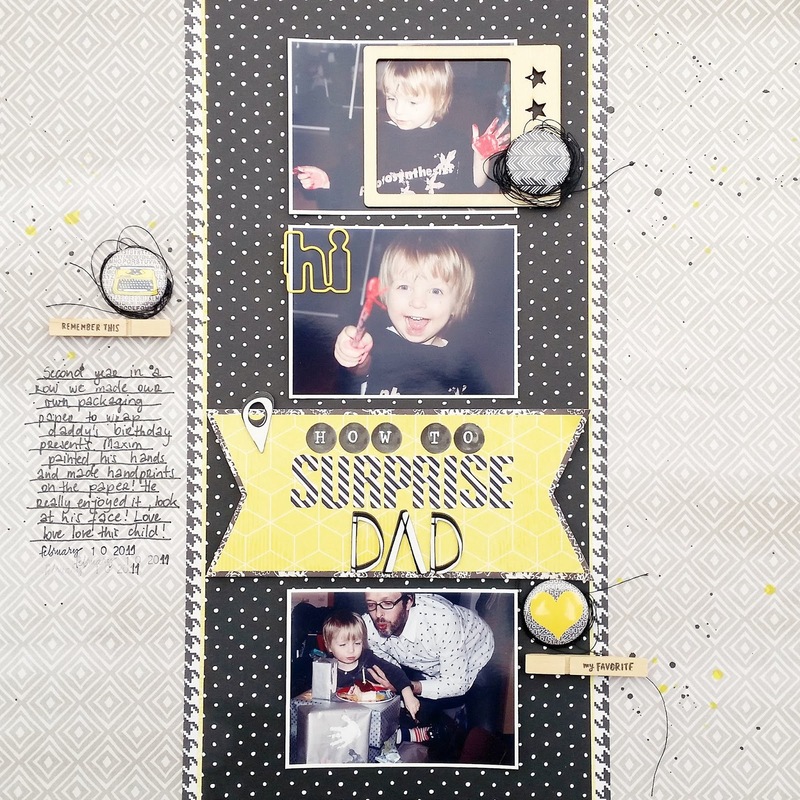 It's time to reveal our Sketch +3 Sketch Challenge! 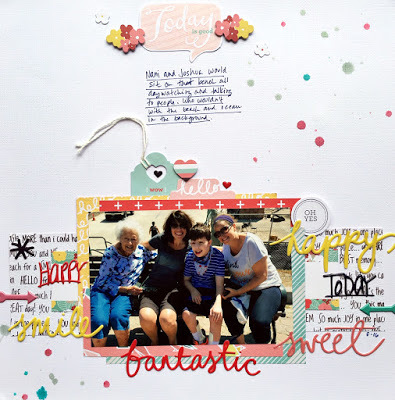 "Stacy here with my Totally Love This Brilliant Smile layout that I made for the SOS Sketch +3 Challenge. I really am always so inspired by sketches and this cool one from Brenda Ragsdale was definitely a great challenge. The first thing I did was turn the sketch on its side. 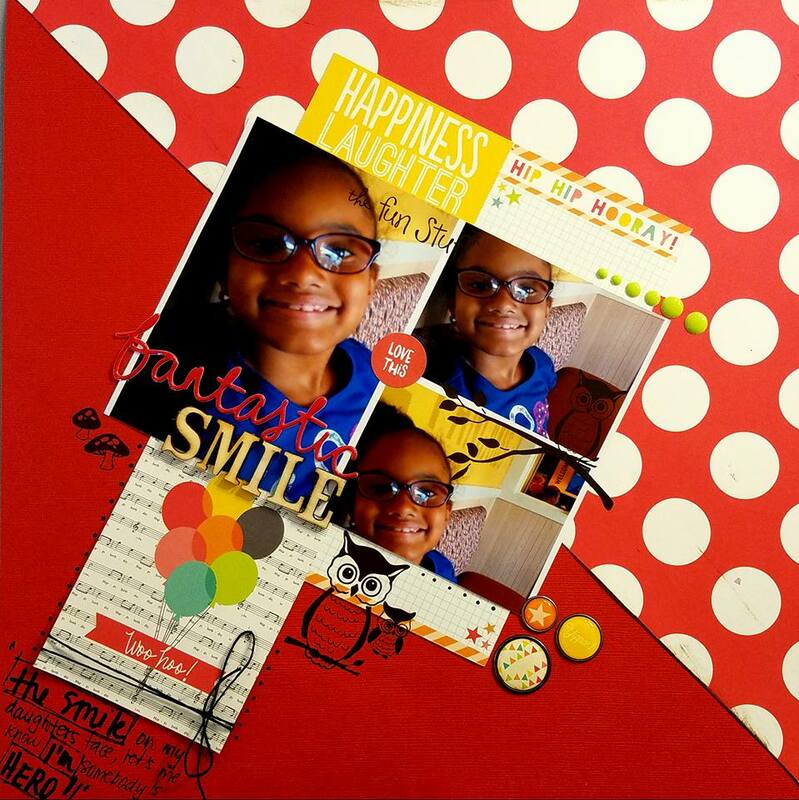 I decided that I wanted to use one large photo instead of 4 smaller ones so I printed out this awesome photo of my oldest daughter in a 6 1/2 x 6 1/2 size. Then I grabbed one of my kits from The Scraproom and got busy. Since the sketch was such a unique shape I wanted this layout to be pretty clean and simple so I wrapped the title work around the matted photo and then just added a few embellishments to finish. My +3 are from List 1 - Polka Dots, from List 2 - Quartz and from List 3 - Red. 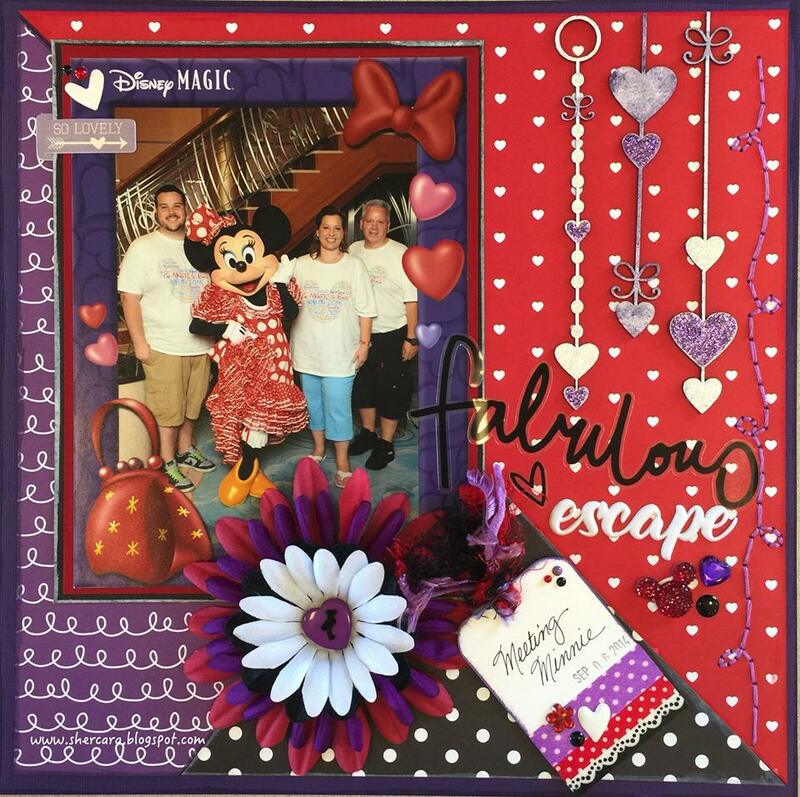 I love how things turned out"
Make sure you upload your layout on the side bar before June 29th! We are excited to announce our Design Team for the July ~ December 2016 term. First we want to thank everyone who took the time to submit an application. We received so many amazing submissions, and as always, it was difficult selecting just four new designers to add to our team. Visit their blogs, check out their creative work, and leave them some love! Start looking for the amazing inspiration each one of them will be sharing with us, inspired by our bi-monthly challenges. starting July 1st. 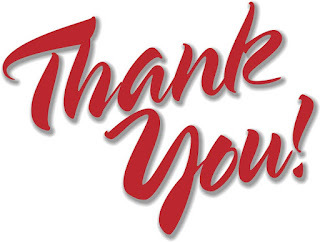 Ladies we are so honored that each of you have agreed to take on another term! At the end of the month, we will be saying goodbye to two of our current designers, and thanking them for their awesome talented contributions and commitment to Scrap Our Stash. Until then, continue to enjoy the fabulous inspiration our current team will be providing you throughout the month of June. 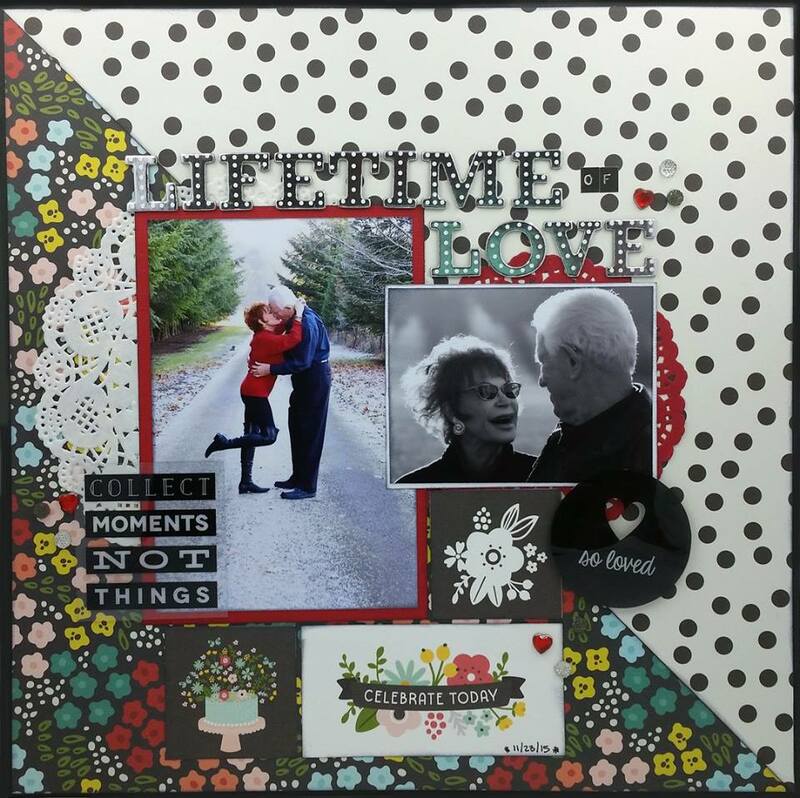 created inspired by the challenge! "I had been wanting to scrap this Father's Day photo for quite some time and this challenge inspired me to pull it out and scrap it! Love challenges like this! 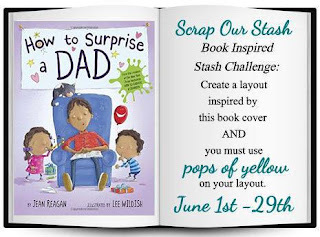 :)I was inspired by the DAD on the cover of the book (of course) and so happy that this collection (Simple Stories Hey Pop) had just enough yellow to "pop" on my layout! I also was inspired by Stuck?! Sketches." Enjoy your day and make sure you stop by and visit us tomorrow, we will be announcing our design team for the Jul ~ Dec 2016 term!!!! \Cant wait to see what you guys come up with from this inspiration!!" day of design team inspiration. I'm constantly inspired by their ideas. 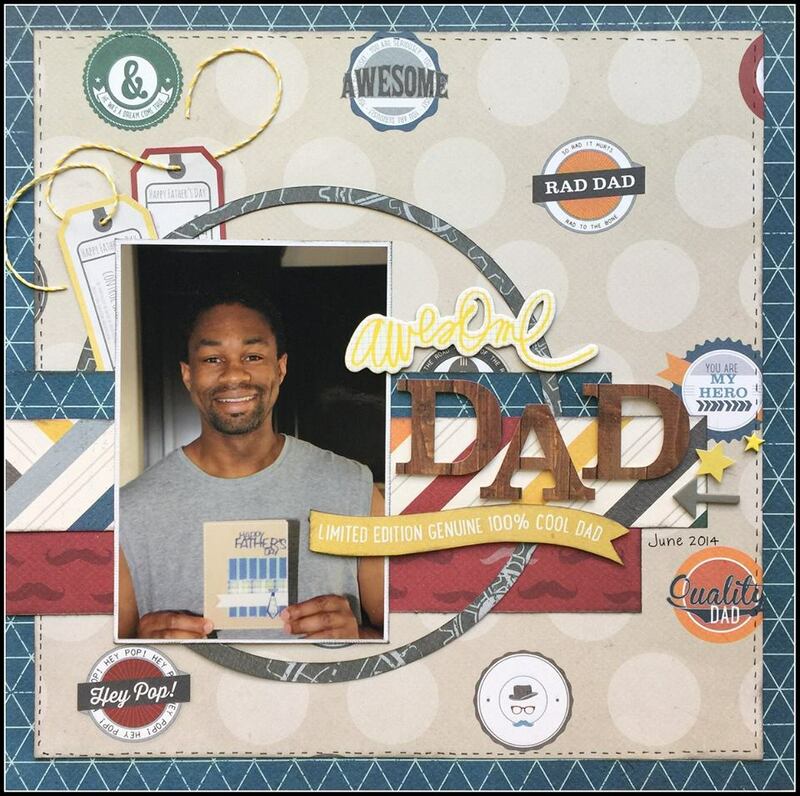 "Of course I had to use a picture of my husband with this book cover inspiration. He is a wonderful dad to our 2 little boys. My starting point was the pops of yellow. I used several shades of yellow, from pale to dark, combined with ocre and brown. 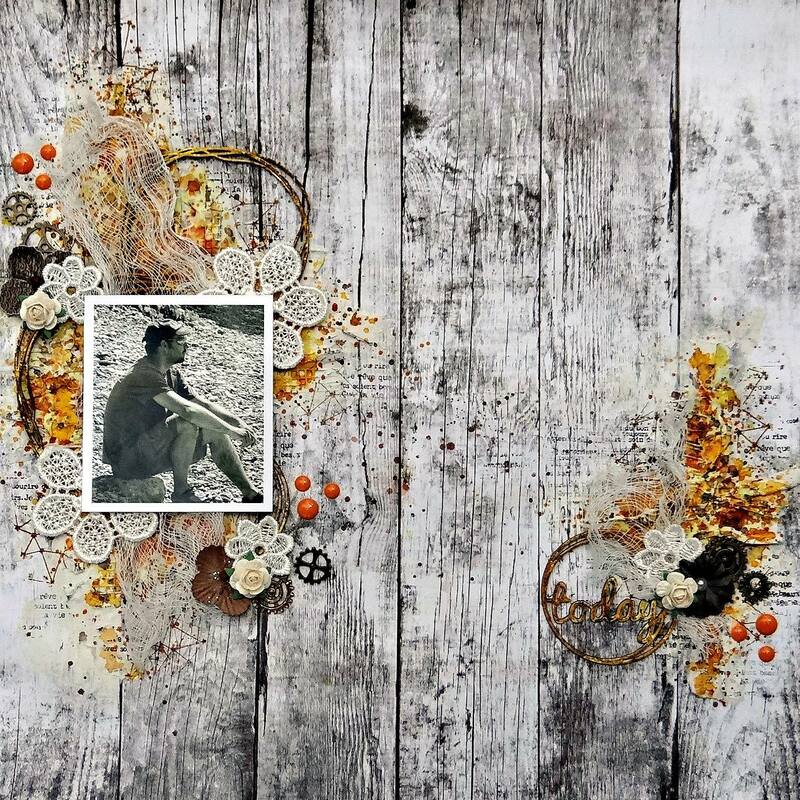 I added flower lace, metal embellishments, enamel dots, teinted chipboards and cheese cloth. 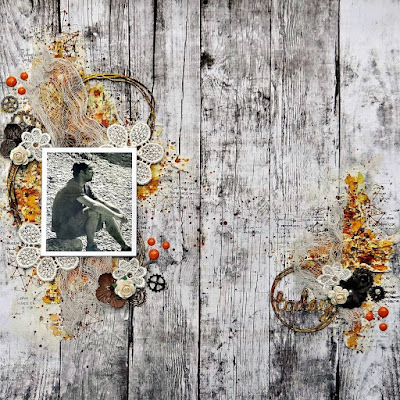 I really like the vintage feeling and look of this layout. It's fun to get out of our comfort zone once in a while." 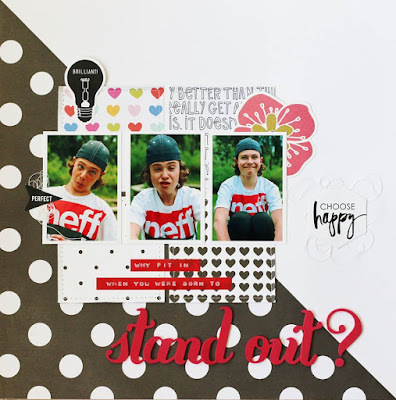 Inspired by Marie's beautiful layout and/or the challenge? click HERE for complete details and rules for the challenge. "Hey there scrappy friends, Zsoka back with you today with a new inspiration. This time for the book cover challenge! This one had me stumped for a moment (a very long moment that is ha!) because I was so focused on the title and kept thinking about what photos I have that would match this title... Well it took me weeks to realize I could just go back in time with my photos because I do actually have several about my boyfriend's birthday surprises etc from when our son was smaller. 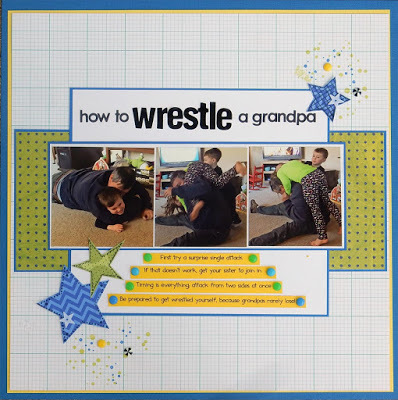 I found these cute photos from when we made some wrapping paper for my boyfriend's birthday presents. We just made some easy and quick (maybe not so quick!) hand prints. 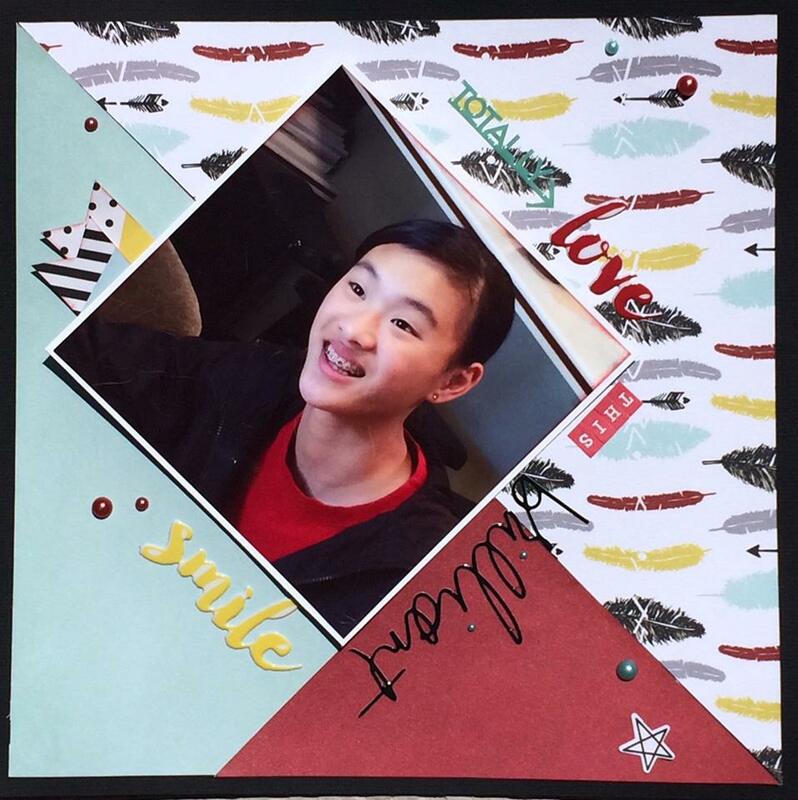 As you can see in the photos, my son really loved this project :). So did his daddy! I also added pops of yellow to fit the requirements of this challenge! I can't wait to see what you guys come up with this month! Hope you enjoyed today's inspiration. We’ll be back tomorrow with more design team inspiration! "I love this book cover. I knew right away what I wanted to do. I remembered this 8 year old picture of my two daughters and their father. It worked perfect for the challenge if you ask me. 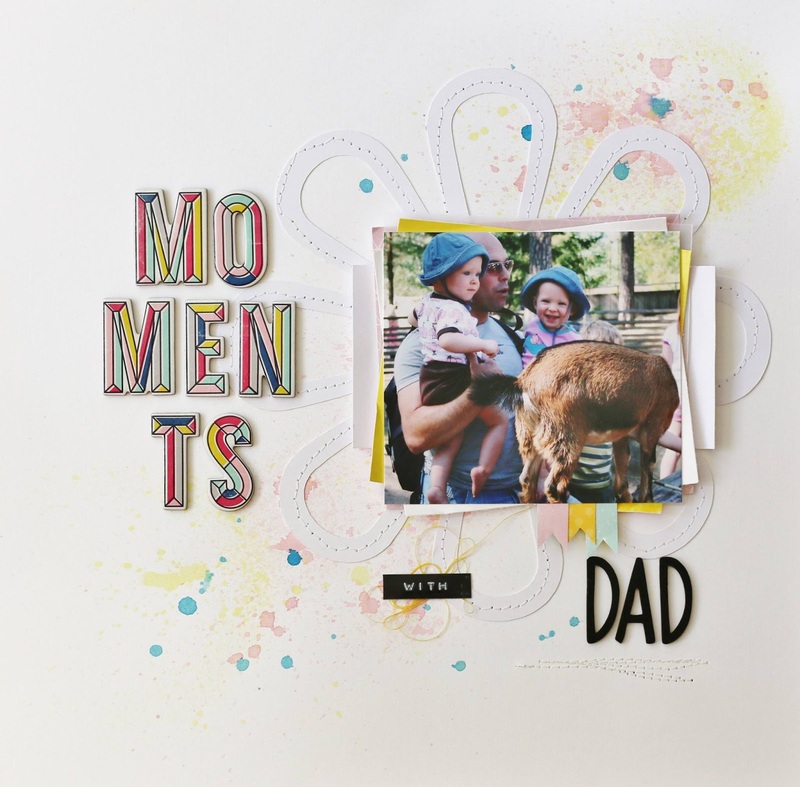 So, I was inspired by the DAD theme, and the two kids and an animal. 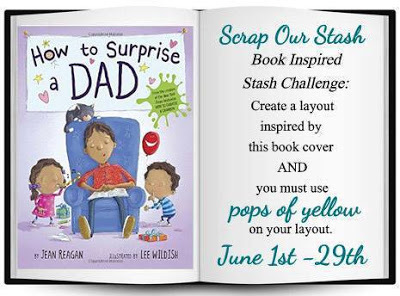 I hope you get inspired and join us for this Book cover challenge!" "I took inspiration from the book title in two ways. 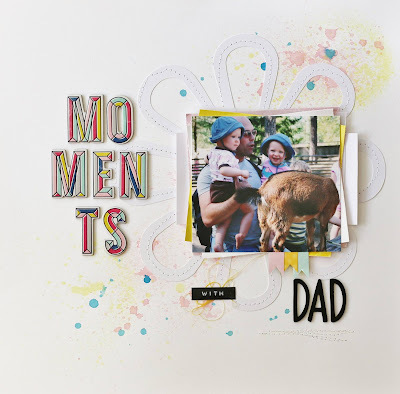 First I created a layout about my husband in his role as "Dad" and second those green paint splatters. In many ways my daughter is just like her dad...including the countless funny faces I always get in photos! 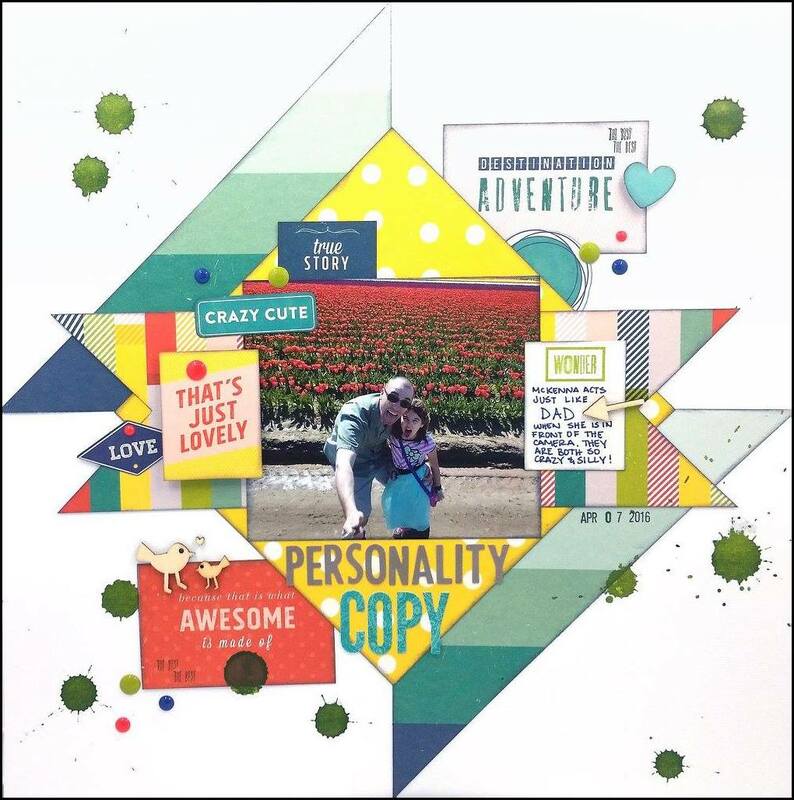 I created this layout using paper from a 6x6 pad and cutting it and arranging the layers so that there were a lot of angles. I loved the pops of yellow on the white background. I then finished it off with these large green splatters. I can't wait to see what you create using this book cover as inspiration!" 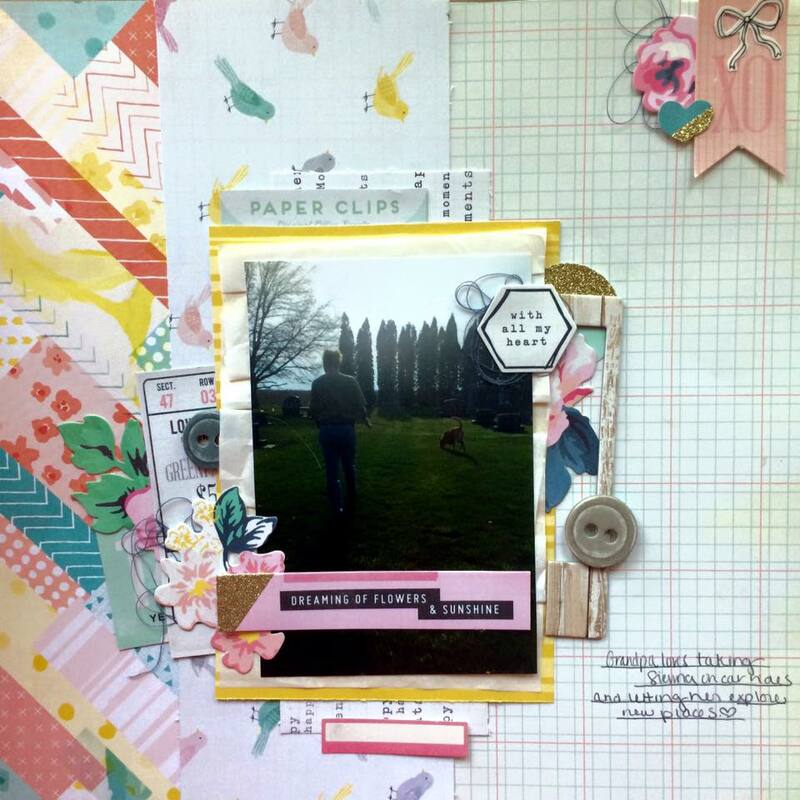 We would love for you to create a layout inspired by this challenge and share it with us! Have an awesome day and return tomorrow for more Design Team inspiration!